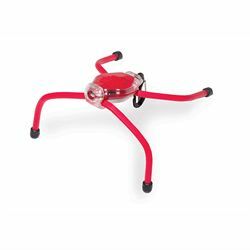 Combining a bright LED microlight with a set of flexible and grippy legs, the BugLit is actually more useful than it is cute! Wrap, bend, twist, stand and angle the flashlight any way you want: it can stick or hang to just about anything! The strong internal wires in the legs hold their shape while the rubber shell provides excellent scratch-free grip. The BugLit even has a carabiner you can clip to your backpack or your keys. Includes 2 CR2016 batteries.